As Roma looked to finally find their way under Luis Enrique as they picked up their second victory on the league this weekend, while Napoli demolished 10 men Inter at San Siro in a pretty controversial match, notably for the home team players who were extremely furious with the referee. At Olympico, Bojan Krkic celebrate his first goal for Roma with a convincing 3-1 victory over Atalanta, who have been doing well before they encountered the Giallorossi. In Milano, goals from Hugo Campagnaro, Christian Maggio and Marek Hamsik, embarrassed the Nerazzurri but Joel Obi’s sending off along with the penalty given were definitely questionable decisions. Enrique Finding His Formula With A Convincing Victory. After grabbing their first win in Serie A in a pretty lucky process last weekend, Luis Enrique started to see something working in his side as they grabbed a 3-1 victory over Atalanta, much to the delight of the Giallorossi fans at Olympico. New summer signing, Bojan opened the scoring for the home team after just 20 minutes as the former Barcelona player sprung the offside trap to control Daniele De Rossi’s fine pass before drilling his shot pass Consigli on Atalanta’s goal. That goal simply turned Roma even more as around 10 minutes later they grabbed their second through Pablo Osvaldo, who grabbed his third goal of the season for his new team after the former Espanyol man coolly finished his chance in front of the visitor’s goal. Although, German Dennis pulled a goal back right after the re-start, the capital club gave a special gift for their captain, Francesco Totti’s birthday with convincing victory as substitute, Simplicio chipped Consigli to seal the home team’s victory. 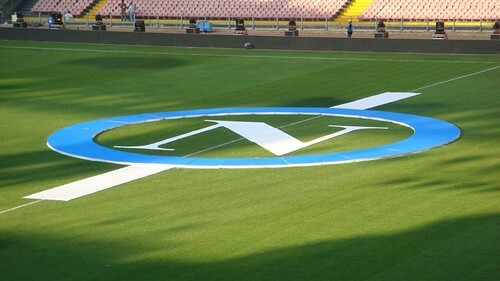 After defeating a depleted Ac Milan side at San Paolo few weeks ago, Napoli conquers another Milano team and making things better, this time it happened on the fashion capital notable stadium, San Siro, as Inter Milan was humiliated by Walter Mazzarri’s side. However, Inter fans would definitely be arguing the referee’s decision as the main culprit for the heavy defeat as the visitor simply got things under control after receiving a questionable victory and playing with a man up since the first period. Obi was the one who received the sending off for Inter after receiving his second yellow card in the game, the Nigerian did deserved a yellow card after barging in on Maggio but he probably shouldn’t get the marching order since his first yellow was rather harsh. Moreover, that incident lead to a penalty kick for the Partenopei, which although was missed by Hamsik, still the bounce got tapped in by Campagnaro to open the score sheet and also card gate for the Nerazzurri. The home team players were a bit distracted by the penalty incident as the foul committed by Obi actually happened just outside of the penalty area, this rage were very visible in the first half as Inter players continuously protested every decision, resulting in several yellow cards flying for the host. However, after Maggio’s second goal, the Nerazzurri obviously lost their appetite in the match and simply left the door opened for Napoli’s third, which pretty much ended the football game as no more important action arrives after Hamsik grabbed his first goal against Julio Cesar in the Slovakian whole career.